“The Tilted Hats”. RPPC. Private Collection. The first person who attracted my attention was the gent in the bowler, I love the way he tilted his head in the opposite direction of the hat. And then I noticed his friends; the charming one next to him tilting his head too, and the others with the hat sideways or to the back. I don’t think I have a favorite in this group; they all took a good picture. There must have been a joke or two about how the camera made the tough looking middle one quite blurry, and I think his nose was broken too. And the front left nature boy with his neck scarf, undone collar and cane reminiscent of a branch. The teen to the front right looks like he was the younger brother of the one standing left. All in all, a fine Edwardian group who must have made quite an impression! And with them goes one year of blogging on WordPress with 416 posts! Photographer: (? )manda Sandberg. Sollefteå, Sweden. Two canes, three hats, a mustache and a whole lot of attitude. Tintype. Private Collection. These three 1880s gentlemen by a balustrade are all very well-dressed, the one to the right with the creased pants, the other to the left with a tight-fitting striped pair. All are wearing Windsor ties typical of the decade. The men look like they were business partners. The confident attitude of the man to the left makes him look like a ruthless go-getter. Roar! Teens with style. RPPC. Private Collection. 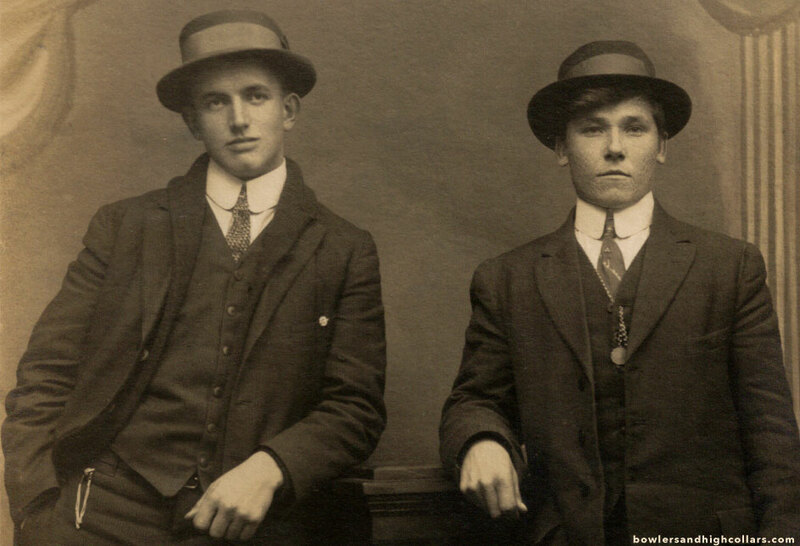 The young gentleman to the left is wearing a layered look with a cardigan between the waistcoat and coat. You’d think I’d encounter more images of gents wearing those this way, but I don’t. This photo was part of a lot of gents posing. At first sight they all look similar, but I always find something interesting in the details. His friend to the right looks like he survived the measles. I accidentally posted this one instead of saving it as a draft. You get an extra post today.